If you are in a fantasy football league and own both Cincinnati Bengals receiver A.J. Green and Houston Texans running back Arian Foster, you no doubt are in first place. Green and Foster have two pretty incredible touchdown streaks going right now: Green has caught a touchdown pass in an NFL-high eight straight games while Foster has scored any sort of touchdown (rushing and receiving) in a league-high 11 straight games. As far as I can tell, the NFL record for consecutive games with a touchdown reception is by Hall of Famer Jerry Rice in 1986-87. And the record for most consecutive games with any sort of touchdown is 18, by future HOFer LaDainian Tomlinson in 2004-05 and Hall of Famer Lenny Moore way back in 1963-65. Foster last didn’t score against Green’s Bengals in Week 14 of 2011. Green was held out of the end zone in Cincy’s Week 1 loss of this season against the Ravens. Bovada offers Week 11 specials on both lock all-pros. That Green will get a receiving score this week at Kansas City is -130, with “no” at even money. The former Georgia star has yet to face the Chiefs in his short career. While Kansas City is terrible, it does rank No. 8 overall against the pass in yardage. However, the Chiefs have allowed 18 touchdown passes, which ranks No. 27. They have allowed at least one touchdown throw in every game but their 9-6 loss to Baltimore. Brandon Flowers will be tasked with trying to slow Green, who might already be the NFL’s best receiver. The Chiefs often leave Flowers alone in single coverage, but don’t look for that much this week. Still, I think Green makes it No. 9 in a row. As for Foster, his prop is whether he scores a TD in every game this season: no a big -750 favorite and “yes” at +400. This week, Foster faces a pretty bad Jacksonville defense. Back in Week 2, the Texans beat the Jaguars 27-7 and Foster had 28 carries for 110 yards and a rushing TD. Backup Ben Tate vultured two TDs in the game (his only two of the season), but Tate is still nursing a hamstring issue and could sit again this week. For what it’s worth, Foster scored in both games vs. Jacksonville last year as well. I think the Texans want to keep the streak going, get him his TD and a big lead and then pull Foster. But if you look toward the end of the season, the Texans could have the top seed in the AFC wrapped up by Week 15 or so. There’s no need to ride Foster hard those weeks. And there’s always the injury factor. Yet I would still roll the dice on yes because of the value, and I think the Texans would like to get Foster the record. He would tie it Week 17 at Indianapolis. Another crazy streak going on right now belongs to MVP favorite Peyton Manning. He has completed at least 70 percent of his passes in an NFL-record six straight games (minimum 20 attempts). 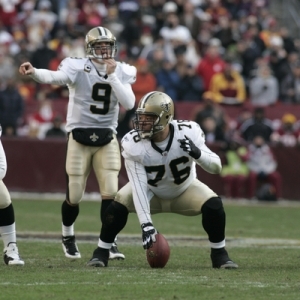 If you are wondering, the single-season record for completion percentage was set by Drew Brees last year at 71.2. Manning is currently at 69.7 percent, largely due to being dragged down by a 26-for-52 game in a Week 3 loss to Houston. Manning’s streak started the next week, and Denver has lost just once since. The prop on Manning is whether he will complete 70 percent again this week against the Chargers: yes -130 and no at even. In the Broncos’ epic Week 6 comeback win in San Diego, Manning completed a season-high 80 percent of his throws. Opposing QBs are completing 64.1 percent of their passes against the Bolts this season. Manning has been under 70 twice all year. Take yes. By the way, Manning remains the 7/5 MVP favorite at the book. Matt Ryan is next at 15/4. Finally, there’s a prop on how many total sacks there will be in the Ravens-Steelers game this week: “over/under” 4.5 (both -115). Both clubs usually rank among the sacks leaders but both are tied for 22nd in the NFL with just 16 apiece. Both defenses are getting old and you won’t see the likes of Troy Polamalu or Ray Lewis on the field Sunday. Still, I think the Ravens could get to Steelers lead-footed backup QB Byron Leftwich at least three times. Ben Roethlisberger was perhaps the best in the NFL in avoiding sacks, but the Ravens defense should be able to tee off on Leftwich. Baltimore gets at least three and Pittsburgh is good for two sacks a game, so take the over. Matt Ryan won the passing yardage prop last week with 411; my pick was Philip Rivers, who was fourth with 337. Adrian Peterson was the +375 favorite to rush for the most yards in Week 10, and I fully admit I didn’t like him at all as I figured the Lions would stack the box and make inconsistent Christian Ponder beat them. But Peterson put up 171 yards as his unbelievable comeback from ACL surgery continues. The Lions’ Calvin Johnson had the most receiving yards with 207. The highest-scoring team was Baltimore with a franchise-record 55 points. I liked New England, which finished tied for the third-most with 37 against Buffalo. The passing yardage favorites this week are Drew Brees (at Oakland) and Aaron Rodgers (at Detroit) at +400. My pick is Oakland’s Carson Palmer at +800. He has thrown for a total of 782 yards and six touchdowns in the last two weeks, although the Raiders have been smashed. Oakland’s top two running backs are out, so Palmer might throw it 60 times against the Saints’ No. 31 pass defense. Peterson is on a bye week, so the rushing favorite is Foster at +300. Unfortunately I can’t pick a back facing either Buffalo (No. 32 in rushing defense) or Tennessee (No. 30) because the Bills played Thursday and the Titans are off. I can’t see a better option than Foster, who probably gets his buck-fifty and TD and then sits the fourth quarter against the Jags. The Bengals’ Green, Colts’ Reggie Wayne and Broncos’ Demaryius Thomas are the +500 receiving favorites. I’m taking Megatron at +800. He’s starting to roll now, and the last time he saw the Packers Johnson had 244 yards in Week 17 of last season. The Patriots (vs. Indy) are the +400 favorites to score the most, but I like New Orleans (+600) in a shootout at Oakland (+1200). The Raiders have given up 97 points the past two weeks.